Would you mind if I changed the name of this recipe from Cheeto Chili to Cheeto Chili Crack? I’m gonna tell you, it’s that good. Now, I’m not a huge Cheetos fan, and I had never tried the Flamin’ Hot Crunchy version. But I know that for many of you, Cheetos is a guilty pleasure, especially the spicy varieties. 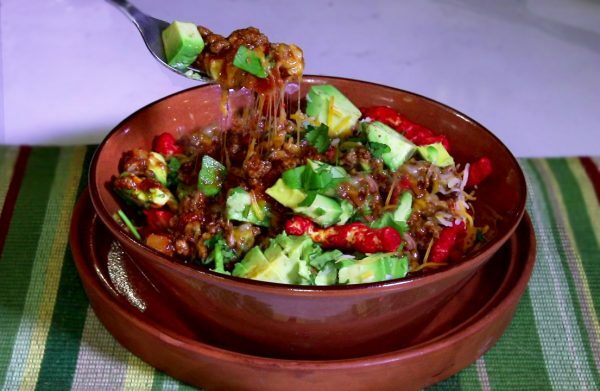 So I approached this recipe with the attitude that, this is just going to be fun, and since it’s homemade chili, cheese and avocado, how bad can it be? I was so wrong. Wrong, wrong, wrong. I loved this dish so much that it shot right to the top of my go-to recipes list for just about any occasion; pot luck, game watching, kid’s cooking night, pool parties, picnics, etc. I’m sure you’re familiar with Frito Pie. It’s a combination of chili, cheese and corn chips. Well, move over Frito Pie. You have just met your flamin’ hot match. Let me paint the delicious picture for you. In a bowl, you pour some Flamin’ Hot Crunchy Cheetos. (The Cheetos Flamin’ Hot Baked version is just as tasty!) Make up some homemade chili or choose your favorite store-bought brand. Pour the chili over the Cheetos. Sprinkle liberally with cheddar cheese, dot with avocado and finish with chopped cilantro. The description doesn’t do this dish justice. You have to just trust me and give it a try. Because I have a pretty good idea that Cheeto Chili is going to be one of your new favorites too! Watch my How To Video for Cheeto Chili Pie here!